My cat has separation anxiety and this is how we are dealing with it. 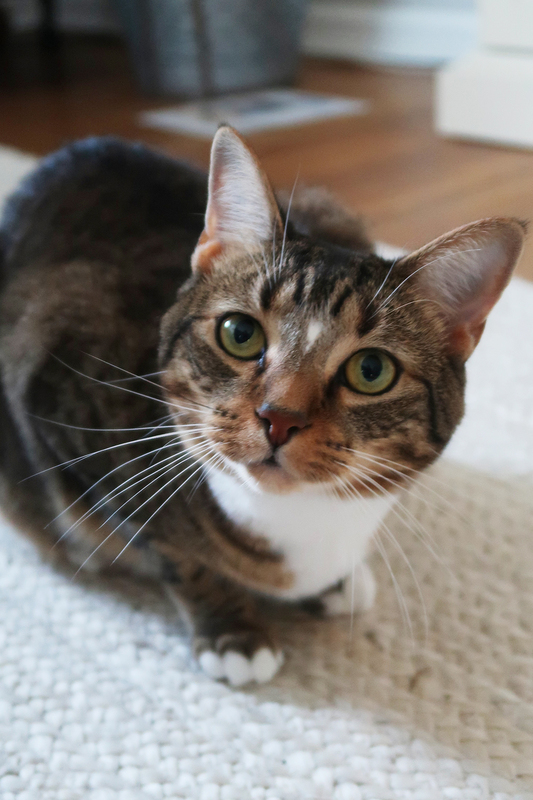 Tips on how to manage your cats anxiety. Almost 2 years ago I went away on a longer vacation than usual and Zoey got sick. She wasn’t acting the same, had stomach issues, urinating in places that smelled like me, excessive meowing and my friendly cat didn’t seem to respond well to anyone that wasn’t me. We went to the vet several times and it turns out she has separation anxiety. She is the friendliest of cats to me but she doesn’t know how to cope with others, especially people who have watched her, are around. She wants to be center of attention but then all the sudden gets panic’d I might leave and then hisses. Two minutes later she will be rubbing up against you. It seems to be really stressful on both of us but we are managing. So what are we doing to manage? Health is very important to part of this process as well as routine. Which is why we decided to take the Purina 28 day challenge. What I love about Purina One is that every ingredient has a purpose with no added fillers or artificial flavors. It’s also made in USA and has a mix of vitamins and minerals designed to bring balanced nutrition, support a healthy immune system and promote a shiny, healthy coat. From eyes to energy to skin and coat, every ingredient is combined in a smart way to make a noticeable difference in your pet’s whole body health. We started our 28 Day Challenge by heading to Target. 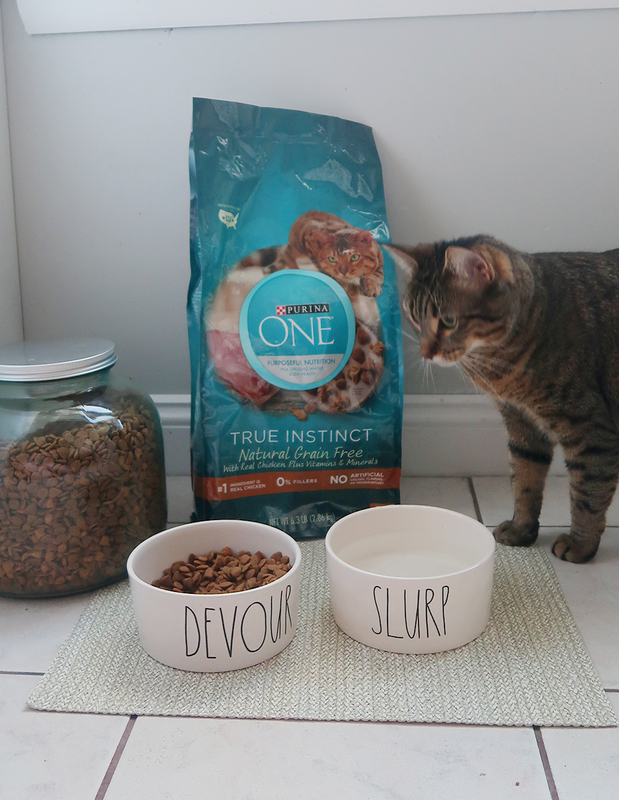 Target is a part of my weekly routine so while I was buying some home decor pieces and maybe a snack I was able to head over to the pet section and find Purina ONE® True Instinct Natural Grain Free With Real Chicken Dry Cat Food. Target is offering a $3 off coupon and a personalized food recommendation for your pet as well as 5% off + free shipping when you subscribe to Purina ONE® at Target. And between 10/7 - 10/13 at Target there is a Temporary Price Cut Purina ONE® Dry Cat Food, Purchase two (2) 3.5lb bags of Purina ONE® Dry Cat Food for $15. Also Print a coupon from 9/19 - 10-13 for FREE $5 Target GiftCard™ with a Purina pet food, litter, and/or treats purchase of $25 or more. Interested in trying the Purina 28 day Challenge? Hover over the photo to click through to Target to shop these products! We started this Challenge in September and just made it through 28 days last week and here is what I have noticed with both Zoey and Dora. Right off the bat the cats loved the taste. Now I am a creature of habitat so my cats have only ever had one type of food other than kitten food their whole life. Well they found out what they had been missing they dove right in. It must have been the real chicken. Now energy is an important part of Zoey’s life and around two weeks in I saw her energy start to improve. Not only was she playing when I normally will play with her but I often found her on her own playing with toys or carrying them around the house. The biggest difference I saw at the end of the 28 days was both cats fur was shiny and felt a great deal softer than their every day coat. For more Purina ONE® inspiration click here. Have a dog and want to do the Purina One® 28 Day Challenge. Check out these out.